Background: Yogic practices may aid in the prevention and management of diabetes mellitus (DM) and reduce cardiovascular complications in the population. The present study has been undertaken to evaluate the effect of yoga therapy on reaction time, biochemical parameters and wellness score of peri and post-menopausal diabetic patients. Materials and Methods: 15 peri and post-menopausal patients receiving standard medical treatment for type 2 DM were recruited and reaction time and biochemical investigations were done before and after a comprehensive yoga therapy program comprising of three times a week sessions for six weeks. A post-intervention, retrospective wellness questionnaire compiled by ACYTER was used to evaluate the comparative feelings of the patients after the therapy program. Results: Yoga training reduced auditory reaction time (ART) from right as well as left hand, the decrease being statistically significant (P<0.05) for ART from the right hand. There was a significant (P<0.01) decrease in fasting and postprandial blood glucose levels as well as low density lipoprotein. The decrease in total cholesterol, triglycerides, and very low density lipoprotein and increase in high density lipoprotein was also statistically significant (P<0.05). All the lipid ratios showed desirable improvement with a decrease (P<0.01) of TC/HDL and LDL/HDL ratios and increase (P<0.05) in the HDL/LDL ratio. Discussion : Shortening of RT implies an improvement in the information processing and reflexes and is the first such report in diabetic patients. This has clinical significance and is worth further exploration with wider, well controlled, randomized studies in the diabetic population. Changes in blood glucose levels may be due to improved insulin sensitivity, decline in insulin resistance and increased sensitivity of the pancreatic b cells to glucose signals. Yoga improved the 'heart friendly' status of lipid profile in our subjects and as our participants were peri and post-menopausal, the decrease in cardiovascular risk profile is of greater significance. A comprehensive yoga therapy program has the potential to enhance the beneficial effects of standard medical management of diabetes mellitus and can be used as an effective complementary or integrative therapy program. A comprehensive review by Innes and Vincent  found beneficial changes in several risk indices, including glucose tolerance, insulin sensitivity, lipid profile, anthropometric characteristics, blood pressure, oxidative stress, coagulation profiles, sympathetic activation and pulmonary function, as well as improvement in specific clinical outcomes. They suggested that yoga may improve risk profiles in adults with non insulin dependent (NIDDM) and may have promise for the prevention and management of cardiovascular complications in this population. Reduced ovarian function after menopause results in adverse changes in glucose and insulin metabolism with derangement of lipoprotein profile that is associated with increased risk of cardiovascular disease. The present study has been undertaken to evaluate the effects of a comprehensive six week yoga therapy program on reaction time, biochemical parameters and wellness score in peri and post-menopausal female diabetic patients. The present study has been conducted as part of a larger study on the effects of yoga therapy on DM that had been accorded permission by the Research and Ethics Councils of the institute. 15 female patients aged 36 - 63 years (50.40 ± 2.47 SEM) receiving medical treatment for type 2 DM at JIPMER were recruited for this study by accidental sampling method and informed consent obtained from them. None of the patients had previously engaged in yoga practice. 11 of them were menopausal for more than a year and 4 were peri-menopausal. 4 of them had coexisting hypertension, 3 musculoskeletal disorders and 7 neurological disorders. Patients with history, signs and symptoms and/or laboratory reports suggestive of nephrologic and ophthalmologic complications were excluded from the study. The following parameters were tested before and after the six-week study period. Reaction time (RT)apparatus (Anand Agencies, Pune) was used for the study. The instrument has a built-in 4 digit chronoscope with a display accuracy of 1 ms. It features four stimuli, two response keys and a ready signal. Switch for selecting right or left response key for any stimulus is provided. Recordings were taken in an air-conditioned laboratory 2 h after a light breakfast. To avoid the effect of lateralized stimulus, visual and auditory signals were given from the front of the subject who was instructed to use his right hand first and then left hand while responding to the signal. In the present study, auditory reaction time (ART) was recorded for auditory beep tone stimulus and visual reaction time (VRT) for red light stimulus. The subjects were instructed to release the response key as soon as they perceived the stimulus. The signals were given from the front of the subjects to avoid the effect of lateralized stimulus and they used their dominant hand while responding to the signal. , All subjects were given adequate exposure to the equipment on two different occasions to familiarize them with the procedure of RT measurement. This was done because RT is more consistent when subjects have had adequate practice. RT was obtained with an accuracy of 1 ms. More than ten trials were recorded and mean of three similar observations was taken as a single value for statistical analysis. Biochemical investigations were done at the Central Lab of the institute where blood was drawn from an antecubital vein in post-absorptive state. On the day of the blood collection, subjects were asked to abstain from yoga practice. Fasting blood glucose (FBG), 2-h postprandial blood glucose (PPBG) and lipid profile including total cholesterol (TC), triglyceride (TG), high density lipoprotein (HDL), low density lipoprotein (LDL) and very low density lipoprotein (VLDL) were requisitioned and evaluated before and after the study period. A post-intervention, retrospective wellness questionnaire compiled by ACYTER was used to evaluate the comparative feelings of the patients after the therapy program. Five different responses ranging from 'worse than before' up to "complete relief/total satisfaction' were utilized to evaluate various physical and psychological aspects of the patient's condition. The questionnaire was finalized in consultation with a 12 member team consisting of 3 eminent medical practitioners, 2 psychologists, 2 yoga experts, 2 eminent yoga therapy consultants, 2 educationalists and one legal anthropologist. The patients had an initial consultation session at the ACYTER Yoga OPD and were given yogic counseling and lifestyle modification advice. They then attended the special sessions conducted at ACYTER for diabetes patients. A comprehensive yoga therapy program was imparted to the patients by qualified yoga instructors at ACYTER for the duration of 60 min thrice a week for six weeks. The schedule is given in [Table 1]. Patients were advised to practice without over straining depending on their individual capacity. There was 99.63% attendance during the 18 directly supervised sessions. Patients were also motivated to practice at home on other days. Of the 15 patients, 5 reported a home practice of 4 days/week, 4 a practice 3 days/week and 2 practiced 2 days/week at home. One patient each reported that they practiced 5, 6, and 7 days/week at home while one reported they didn't practice at home at all. Analysis of patient feedback showed that the duration of home practice was 30 min for 9 patients, 60 min for 3 patients and 40 min for 2 patients. Data was assessed for normality using GraphPad InStat and passed normality testing by Kolmogorov-Smirnov test. Statistical analysis was done using Students t (paired) test and P values less than 0.05 were accepted as indicating significant differences between pre and post-intervention data. 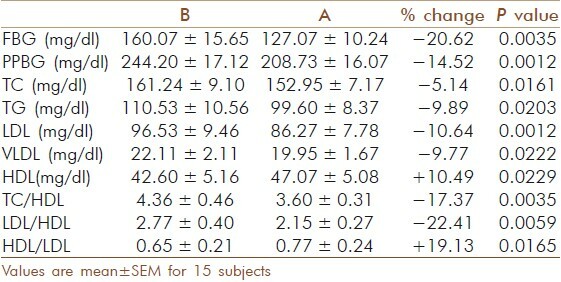 The results are given in [Table 2] and [Table 3]. Yoga training decreased ART and VRT from both right and left hands. However, the decrease was statistically significant (P=0.0357) only for ART from the right hand (from 196.87 ± 9.25 to 178.04 ± 6.36 ms). The decrease in ART from left hand from 193.31 ± 6.19 to 179.44 ± 5.03 ms was appreciable (7.18%) but missed statistical significance (P=0.0583). The decrease in VRT from right as well as left hand was not statistically significant [Table 2]. FBG decreased significantly (P=0.0035) by 20.62% from 160.07 ± 15.65 to 127.07 ± 10.24 mg/dl. PPBG also decreased significantly (P=0.0012) by 14.52% from 244.20 ± 17.12 to 208.73 ± 16.07 mg/dl. There was a statistically significant (P=0.016) decrease in TC from 161.24 ± 9.10 to 152.95 ± 7.17 mg/dl (5.14%). The 9.89% decrease in TG from 110.53 ± 10.56 to 99.60 ± 8.37 mg/dl was also significant (P=0.020) along with the 10.64% decrease in LDL from 96.53 ± 9.46 to 86.27 ± 7.78 mg/dl (P=0.0012) and a significant (P=0.022) 9.77% decrease in VLDL from 22.11 ± 2.11 to 19.95 ± 1.67 mg/dl. On the other hand, HDL increased significantly (P=0.022) from 42.60 ± 5.16 to 47.07 ± 5.08 mg/dl, an increase of 10.49%. There was a significant (P=0.003) decrease of 17.37% in TC/HDL ratio from 4.36 ± 0.46 to 3.60 ± 0.31, a significant (P=0.005) decrease of 22.41% in LDL/HDL ratio from 2.77 ± 0.40 to 2.15 ± 0.27. There was a significant (P=0.016) increase of 19.13% in the HDL/LDL ratio from 0.65 ± 0.21 to 0.77 ± 0.24. The post-intervention overall wellness scores of the participants are given in [Figure 1] and the detailed breakup of % responses to each question is given in [Table 4]. 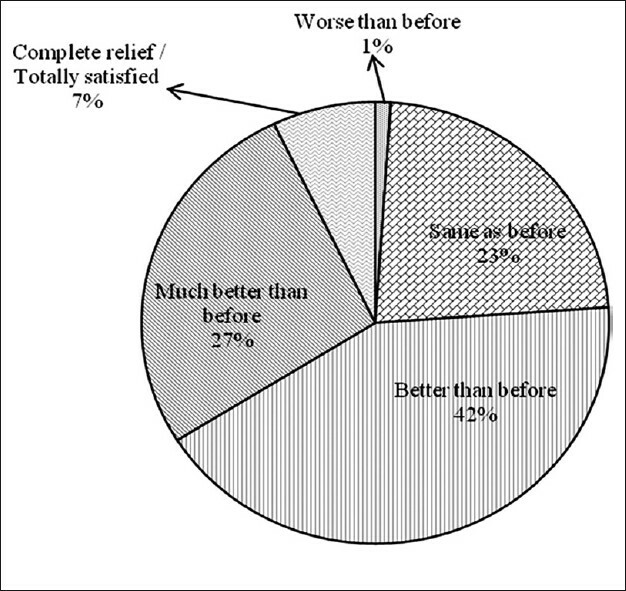 The results of the total overall retrospective wellness scores indicated that 7% attained complete relief and total satisfaction after the therapy program while 27% were much better than before. 42% were better than before while 23% reported no change in their condition. The condition of 1% was worse than before. Fasting as well as post-prandial blood glucose levels decreased significantly in our subjects following the yoga therapy program. This is consistent with earlier studies that have reported that yoga training results in a reduction in both FBG and PPBG levels and better glycemic control. , The 20.62% reduction in FBG in our subjects is comparable with the 6.1-34.4% reduction reported in a review of 25 studies on yoga and diabetes by Innes and Vincent. Sahay  has reported an improvement in insulin sensitivity and decline in insulin resistance in subjects practicing yoga while Manjunatha et al.,  reported that the performance of asanas leads to an increased sensitivity of the b cells of pancreas to glucose signals. It is possible that a similar mechanism is responsible for the improvements in blood sugar levels of our subjects. Increased sympathetic activity, enhanced cardiovascular reactivity and reduced parasympathetic tone have been strongly implicated in the pathogenesis of insulin resistance syndrome, atherosclerosis and cardiovascular diseases. Innes and Vincent  have suggested that yoga reduces this risk profile by decreasing activation of the sympatho-adrenal system and the hypothalamic-pituitary-adrenal axis and also by promoting a feeling of wellbeing along with direct enhancement of parasympathetic activity via vagus nerve. They also suggested that yoga provides a positive source of social support that is a factor associated with reduced risk for cardiovascular diseases. All these factors are applicable to our study and may explain the positive changes produced following the adherence to the comprehensive yoga therapy program. The significant decreases in TC, TG, LDL and VLDL values coupled with significant increase in HDL in our participants imply an improved lipid profile having good prognostic value. This decrease of 'bad' cholesterol and a concomitant increase in 'good' cholesterol has significance when viewed in light of the cardiovascular risk profile of diabetic patients. It has been previously reported that hatha yoga exercise and conventional PT exercise may have preventative and protective effects on DM by decreasing oxidative stress and improving antioxidant status. A similar mechanism may be working in our patients as a systematic review also found the effects of yoga training to be more prominent with regard to fasting blood glucose level and lipid profile. Innes and Vincent  reported that all 12 studies reviewed by them suggested that yoga improves lipid profile. Reductions in TC, TG, and LDL, VLDL and increase in HDL in our subjects are comparable with the findings of their review. Upon analysis of the different relative cholesterol ratios, it is apparent that the yoga therapy program improved the 'heart friendly' status of lipid profile in our subjects. Normally the 'safe' TC/HDL ratio should be less than 4. This was initially 4.36 ± 0.46 in our patients and after the six-week therapy program decreased by 17.37% to a safe level of 3.60 ± 0.31. A healthy LDL/HDL ratio should be less than 3. Though the initial pre-training level in our subjects was a higher normal value it also reduced by 22.41% to a lower normal value. HDL/LDL ratio should normally be more than 0.3 but it is preferable to maintain it above 0.4. This also increased by 19.13% to a higher normal value implying better prognosis of cardiovascular health. The findings of an improved lipid profile status is especially important in our study as 11 of the participants were postmenopausal while the other 4 were pre and peri-menopausal. Loss of ovarian function after menopause results in adverse changes in glucose and insulin metabolism with derangement of lipid profile that is associated with increased risk of cardiovascular disease. It has also been reported that heart disease increases 5 times in females who have DM and that the 'female advantage' over men with regard to coronary heart disease is lost after menopause. Hence the positive changes in lipid profile in our peri-menopausal diabetic subjects have great significance. It has been reported that a short lifestyle modification and stress management educational program leads to remarkable improvement in the subjective wellbeing scores and can therefore make an appreciable contribution to primary prevention as well as management of lifestyle diseases. Majority of our patients reported an improvement in appetite, ability to concentrate, control anger, confidence levels, ease of breathing, energy level, enjoyment of life with calm and fresh feeling [Table 4] and [Figure 1]. They also reported a reduced feeling of hopelessness, nervousness and loneliness. They reported improvements in general flexibility and joint mobility along with better general mood, sense of relaxation and wellbeing. Menstrual cycles normalized in all four patients who were pre and peri-menopausal. There was a decrease in stress levels with improved quality and duration of sleep. This is similar to a recent report that yoga improves psychological outcomes in type 2 diabetes patients with improved well being and reduced anxiety. Yoga may be improving mental and emotional components of the personality and subjective well being reported by our participants may be a contributing psycho-physiological factor in the desirable improvements shown by our patients. This aspect needs further exploration. Interestingly, one participant who didn't practice at home reported that there was an increase in her medication while the one who practiced every day at home, reported that her medication had reduced. Though both had reported improvements in the well being questionnaire, responses of the one who practiced every day were in the range of 'much better' to 'total relief' while responses of the other one were mainly in the 'same' to 'better' range. The potential benefits being contributed by the different practices in our study may be hypothesized as follows. Surya namaskar improves metabolic function, helping in utilizing excess glucose while toning up the musculoskeletal system. Tadasan evokes a sense of stability and balance both physically and mentally while asanas such as parivritta trikonasan, padahastasan, ardha-kati-chakrasan, vakrasan, paschimottanasan, pavanamuktasan, bhujangasan and dhanurasan by their twisting and compression-relaxation actions may be stimulating intra-abdominal organs such as liver and pancreas thus producing benefits in the lipid profile. Ardha halasan and viparitakarani may be harmonizing psycho-neuro-endocrine function as seen in reaction time while chandranadi pranayam may be normalizing autonomic balance. Pranav pranayam, nadi shuddhi and savitri pranayam may contribute toward a sense of calmness that enhances inherent healing potentials while kayakriya and shavasan create a sense of mind-body harmony that corrects the psycho-somatic component of DM. The main strength of present study is the excellent compliance and regularity of the yoga practice by the patients both during the directly supervised sessions (99.63% attendance) and at home, where all except one patient practiced regularly for an average of 4 days/week and 30-40 min per day. Hence the all-round benefits obtained can be attributed to the dedicated and regular practice of our comprehensive yoga therapy program. As the participants were peri and post-menopausal, the decrease in cardiovascular risk profile is of great significance. The main drawback of our study is lack of a control group and the accidental sampling method used. As our participants were also receiving standard hospital medication, it is difficult to determine the relative effects of yoga and medical management. However, as there was no change in the medical management protocol that had already stabilized the clinical status of our patients, we can reasonably conclude that the additional benefits are due to the yoga therapy program. It is suggested that further randomized control studies should be done to confirm these findings and facilitate a deeper understanding of the mechanisms underlying such beneficial results. In conclusion, our study shows that a comprehensive six-week yoga therapy training program produces significant improvement in reaction time, blood glucose and lipid profile of peri and post-menopausal diabetes patients. A comprehensive yoga therapy program has the potential to enhance the beneficial effects of standard medical management of DM and can be used in an effective complementary or integrative therapy program. The authors wish to thank the Department of AYUSH, Ministry of Health and Family Welfare, Government of India for establishing ACYTER as a collaborative venture between the MDNIY, New Delhi and JIPMER, Puducherry. 1. Funderburk J. Science Studies Yoga: A review of physiological data. Honesdale, Pennsylvania, USA: Himalayan International Institute of Yoga Science and Philosophy; 1977. 2. Khalsa SB. Yoga as a therapeutic intervention: A bibliometric analysis of published research studies. Indian J Physiol Pharmacol 2004;48:269-85. 3. Sharma R, Gupta N, Bijlani RL. Effect of yoga based lifestyle intervention on subjective well-being. Indian J Physiol Pharmacol 2008;52:123-31. 4. Innes KE, Vincent HK. The Influence of yoga-based programs on risk profiles in adults with type 2 diabetes mellitus: A systematic review. Evid Based Complement Alternat Med 2007;4:469-86. 5. Gupta N, Khera S, Vempati RP, Sharma R, Bijlani RL. Effect of yoga based lifestyle intervention on state and trait anxiety. Indian J Physiol Pharmacol 2006;50:41-7. 6. Malathi A, Asha D, Shah N, Patil N, Maratha S. Effect of yoga practices on subjective well being. Indian J Physiol Pharmacol 2000;44:202-6. 7. Sahay BK. Role of yoga in diabetes. J Assoc Physicians India 2007;55:121-6. 8. Malhotra V, Singh S, Tandon OP, Sharma SB. The beneficial effect of yoga in diabetes. Nepal Med Coll J 2005;7:145-7. 9. Bijlani RL, Vempati RP, Yadav RK, Ray RB, Gupta V, Sharma R, et al. A brief but comprehensive lifestyle education program based on yoga reduces risk factors for cardiovascular disease and diabetes mellitus. J Altern Complement Med 2005;11:267-74. 10. Yang K. A Review of yoga programs for four leading risk factors of chronic diseases. Evid Based Complement Alternat Med 2007;4:487-91. 11. Chaya MS, Ramakrishnan G, Shastry S, Kishore RP, Nagendra H, Nagarathna R, et al. Insulin sensitivity and cardiac autonomic function in young male practitioners of yoga. Natl Med J India 2008;21:217-21. 12. Jain SC, Uppal A, Bhatnagar SO, Talukdar B. A study of response pattern of non-insulin dependent diabetics to yoga therapy. Diabetes Res Clin Pract 1993;19:69-74. 13. Igweh JC, Nwagha IU, Okaro JM. The effects of menopause on the serum lipid profile of normal females of South East Nigeria. Niger J Physiol Sci 2005;20:48-53. 14. Madanmohan, Thombre DP, Das AK, Subramaniyan N, Chandrasekar S. Reaction time in clinical diabetes mellitus. Indian J Physiol Pharmacol 1984;28:311-4. 15. Madanmohan, Udupa K, Bhavanani AB, Vijayalakshmi P, Surendiran A. Effect of slow and fast pranayams on reaction time and cardiorespiratory variables. Indian J Physiol Pharmacol 2005;49:313-8. 16. Sanders AF. Elements of human performance: Reaction processes and attention in human skill. New Jersey , USA: Lawrence Erlbaum Associates; 1998. p. 21. 17. Madanmohan, Thombre DP, Balakumar B, Nambinarayanan TK, Thakur S, Krishnamurthy N, et al. Effect of yoga training on reaction time, respiratory endurance and muscle strength. Indian J Physiol Pharmacol 1992;36:229-33. 18. Bhavanani AB, Mohan M, Udupa K. Acute effect of mukh bhastrika (yogic bellows type breathing) on reaction time. Indian J Physiol Pharmacol 2003;47:297-300. 19. Singh S, Malhotra V, Singh KP, Madhu SV, Tandon OP. Role of yoga in modifying certain cardiovascular functions in type 2 diabetic patients. J Assoc Physicians India 2004;52:203-6. 20. Manjunatha S, Vempati RP, Ghosh D, Bijlani RL. An investigation into the acute and long-term effects of selected yogic postures on fasting and postprandial glycemia and insulinemia in healthy young subjects. Indian J Physiol Pharmacol 2005;49:319-24. 21. Gordon LA, Morrison EY, McGrowder DA, Young R, Fraser YT, Zamora EM, et al. Effect of exercise therapy on lipid profile and oxidative stress indicators in patients with type 2 diabetes. BMC Complement Altern Med 2008;8:21. 22. Aljasir B, Bryson M, Al-shehri B. Yoga practice for the management of type II diabetes mellitus in adults: A systematic review. Evid Based Complement Alternat Med 2010;7:399-408. 23. Ren J. Vardiac health and diabetes in women: Problems and prospects. Minerva Cardioangiol 2006;54:289-309. 24. Kosuri M, Sridhar GR. Yoga practice in diabetes improves physical and psychological outcomes. Metab Syndr Relat Disord 2009;7:515-7.